[BBTN] Airports have warned of potential delays through immigration control on Wednesday (March 20) due to a strike by Border Force staff. Employees, who are members of the Public and Commercial Services (PCS) union, are due to go on a 24-hour strike designed to coincide with tomorrow’s budget from chancellor George Osborne. Heathrow warned that arriving passengers “may experience some delays at immigration” but said it was not changing any flight schedules. PCS workers around the UK are taking industrial action in protest at proposed cuts to pay, pensions and working conditions. The union said the timing of the strike was designed “to put maximum pressure on ministers who are refusing to talk to us”. Stansted said its flights would be operating as normal but added they may be some delays at passport control. “UK Border Force has contingency plans in place and we will work with them to ensure any disruption to our passengers is kept to a minimum,” said the airport. It was a similar message from Luton which advised incoming passengers to take a series of steps to ease any potential delays including the use of automatic e-Passport gates, having landing cards fully completed and staying in family groups. For the latest updates on the strike from UKBA, CLICK HERE…..
Read the original story at Buying Business travel…..
[Evening Standard] Extra passport staff were drafted into Heathrow today as passengers complained of continuing border delays at the airport. Lucy Moreton, from the Immigration Services Union, said UK Border Force officers had been flown in from Manchester in a bid to reduce the queues which have seen passengers forced to wait for hours to enter the country. Downing Street today blamed the rain for some of the problems, saying that “severe weather conditions” had led to planes being delayed and queues building up. But Steve Ridgway, the head of Virgin Atlantic, accused ministers of economic “madness”. He said the Government had cut border guard numbers without ensuring that adequate technology was available to replace them — and warned that ministers were jeopardising the country’s prosperity when Britain needed “everything it can get” from overseas business and tourism. Read the full story at This is London…..
[Belfast Telegraph] Heathrow airport has been ordered by the Border Force to stop handing out leaflets to passengers acknowledging the “very long delays” at immigration. Amid increasing anger at the length of queues for travellers arriving at border control, airport operator BAA has tried to defuse tensions with a leaflet apologising for the problems. It said people arriving in the country “deserved a warmer welcome” and explained how to complain to the Home Office. But Marc Owen, director of UK Border Agency operations at Heathrow, has told BAA that the leaflets are “inappropriate” and that ministers would take “a very dim view”. In an email obtained by The Daily Telegraph, he said: “The leaflet… is both inflammatory and likely to increase tensions in arrivals halls especially in the current atmosphere. It is inappropriate in that it is not for you to display how to complain on our behalf. Read the full story at The Belfast Telegraph….. There have been a number of incidents in recent weeks, including a Spanish man who had to be restrained by counter-terrorism officers at Heathrow on Wednesday after bursting through security.The news follows reports passengers are forced to wait up to 90 minutes to clear passport control at Heathrow and increases pressure on Immigration Minister Damian Green to step in and address the problem. Last month 20 passengers stormed through security at Birmingham Airport, angry after waiting for two hours and police were deployed at Heathrow on Thursday after a group of fuming Americans began shouting at border staff. Home secretary Theresa May is also underfire for reducing the manpower at borders. She plans to cut the number of officers from…..
Read the full story from The Daily Mail…..
[FT] Damian Green, the immigration minister, has been summoned to explain a crisis at border control to MPs after a spate of lengthy queues and increased waiting times spread to Heathrow’s flagship terminal. Keith Vaz, chairman of the home affairs select committee, told the Financial Times that he had asked Mr Green to appear before the panel of MPs as reports of “chaos” at British airports gathered pace. The delays are thought to have been caused by staffing cuts at the UK Border Agency – which kicked in at the beginning of the new financial year – combined with a Home Office ban on lighter passenger checks after a furore last summer in which some border officials relaxed security controls without ministerial permission. The force is due to lose just under 20 per cent of its personnel by 2015 as part of the government’s austerity drive. Read the full article at Investors Chronicle…. Heathrow Airport may struggle to cope with extra passengers arriving during the London Olympics, MPs have warned. "Not enough thought seemed to have been given to ways of coping with long queues at immigration"
Culture Select Committee chairman John Whittingdale said not enough thought seemed to have been given to ways of coping with long queues at immigration. He said the UK Border Agency had suggested it had insufficient money to open all of its passport stations. The now separate Border Force said it was “well-prepared… with additional staff available for busy periods”. Mr Whittingdale outlined the committee’s concerns in a letter to Culture, Media and Sport Secretary Jeremy Hunt. He said two members, Therese Coffey and Gerry Sutcliffe, had attended a briefing by Heathrow operator BAA and gathered that it saw the departure of large numbers of spectators and athletes at the end of the Games as the biggest challenge. But Mr Whittingdale said the MPs “did not leave the briefing confident that Heathrow was ready to cope with the arrival of a huge number of competitors, Olympic family and visiting tourists in timely fashion”. The letter went on: “We understand that significant preparations have been made to accommodate unusual sporting equipment, special lanes for the Olympic family, welcoming arrangements for competitors and additional Olympic ambassadors. “However, far less thought seems to have been given to the issue of how to deal with long queues at immigration. Mr Whittingdale continued: “While visiting tourists will understand that the Olympics is a busy time, if the wait (at immigration) is in excess of an hour it may deter tourists from returning. Full story at BBC News…. Holidaymakers face months of prolonged delays getting back into the country because of a shortage of immigration officers and tighter checks, it has emerged. Already it is not uncommon for EU passengers to spend more than an hour to clear checkpoints staffed by the UK Border Agency. Their plight is likely to get worse as the summer unfolds, with the Immigration Service Union predicting that delays could reach three to four hours at busiest times, especially for those not carrying EU passports. 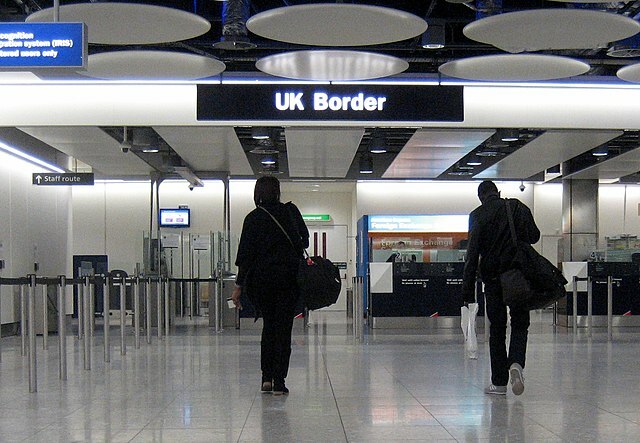 Earlier this month The Daily Telegraph disclosed that airports and airlines have warned the UK Border Agency of chaos because of staff shortages. According to the Immigration Service Union the chaos could begin over the summer, partly because the Agency’s fixed rostering system takes no account of passenger flows. In addition the Home Office is planning to cut the size of the workforce at a time when stricter controls are being used. Read the full strory at Telegraph Travel…. Britain’s airports will be reduced to ‘gridlock’ this Easter because there are not enough staff to carry out checks on passports, airlines have warned the Home Secretary. Theresa May has been told by 11 airlines, including British Airways and Virgin Atlantic, that the UK Border Agency does not have the resources to check the passports of everyone coming into Britain. A separate memo sent by Virgin Atlantic to the home affairs select committee warns that long queues at passport control could leave passengers stranded on planes and put the operation of “entire airports at risk”. Easter weekend is one of the busiest times of the year for the airports with more than 1.5 million holidaymakers expected to travel overseas. More than 370,000 passengers will leave Heathrow between Good Friday and Easter Monday while Gatwick will handle 200,000. The Virgin Atlantic memo says: “If arriving passengers are unable to proceed efficiently through the UK border then the entire airport operation will be at risk. Passengers arriving late from passport control to collect their luggage will cause congestion in the baggage hall, delaying delivery of luggage from later flights. “If there is no space in the immigration hall for any more arrivals then airlines will be forced to keep passengers aboard the aircraft, thus jeopardising the operation of subsequent flights. Read the memo to Theresa May in full……. The airlines are urging the Government to employ more border control staff or relax tough restrictions on immigration checks introduced after a scandal at the UK Border Agency last November. Brodie Clark, the head of the agency, resigned after Mrs May said he had relaxed checks without her permission. He was later given £100,000 compensation by the Home Office, with neither side admitting fault. Full Telegraph Travel story here…..